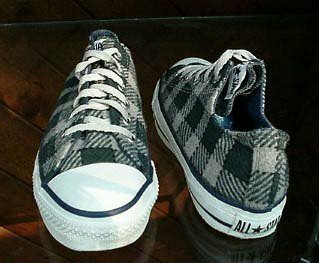 Photo gallery of chucks made with plaid fabric uppers. 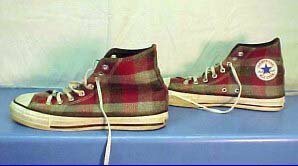 1 Plaid High Top and Low Cut Chucks View of red and orange plaid foldover high top chucks. 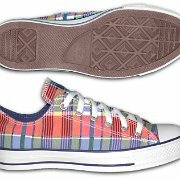 2 Plaid High Top and Low Cut Chucks Different views of blue, red, and yellow madras foldover high top chucks. 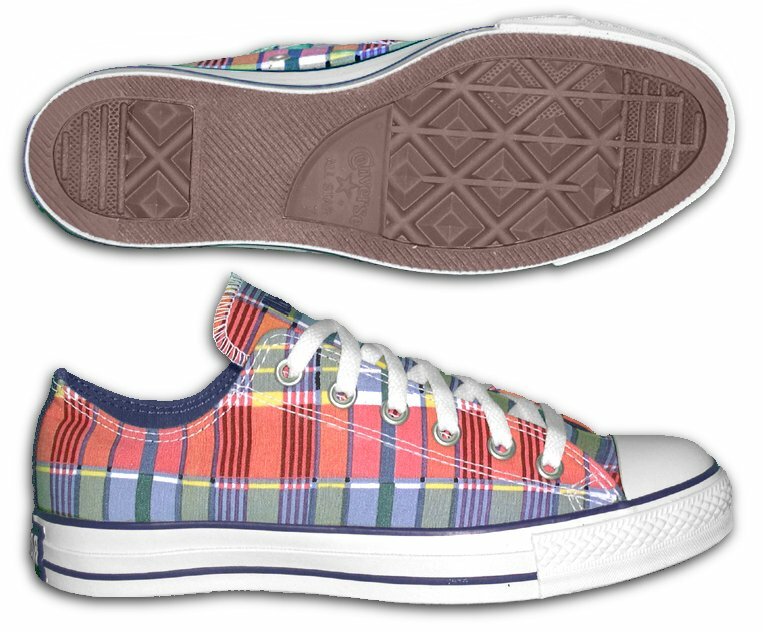 3 Plaid High Top and Low Cut Chucks Side and sole views of blue, red, and yellow low cut madras chucks. 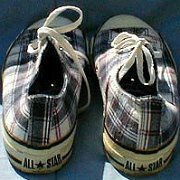 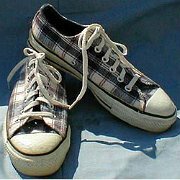 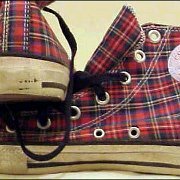 4 Plaid High Top and Low Cut Chucks Wearing holiday high top chucks. 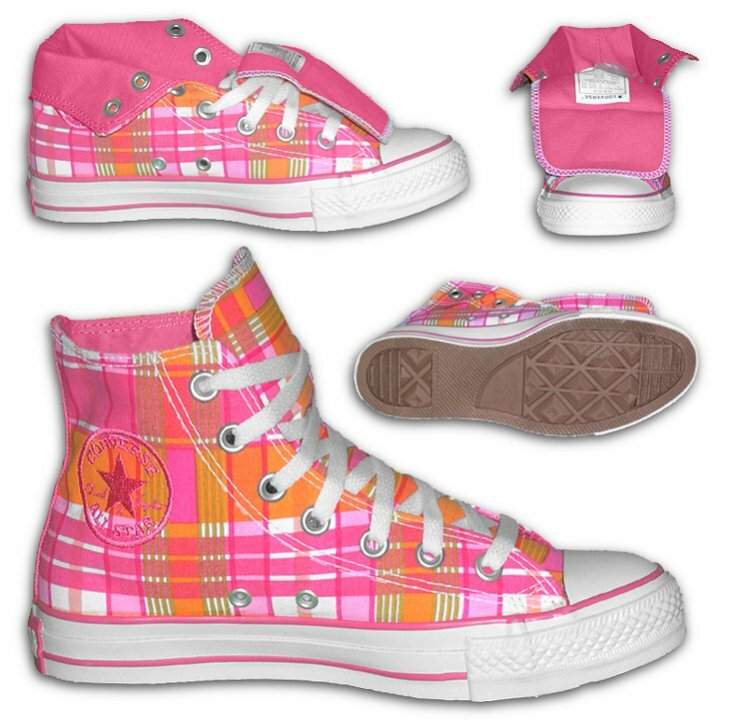 5 Plaid High Top and Low Cut Chucks Red and gray woolen plaid high tops, inside patch and rear heel patch views. 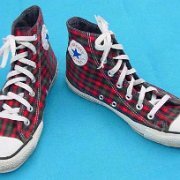 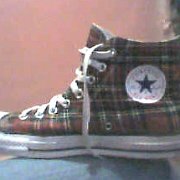 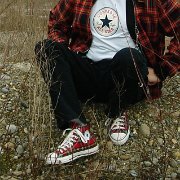 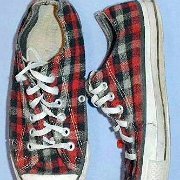 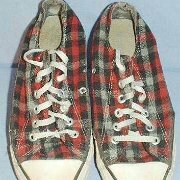 6 Plaid High Top and Low Cut Chucks Worn red, green, and blue canvas plaid high tops with black laces, rear and inside patch views. 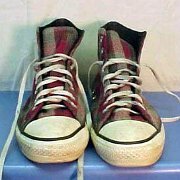 7 Plaid High Top and Low Cut Chucks Inside patch view of a right red and green plaid high top chuck. 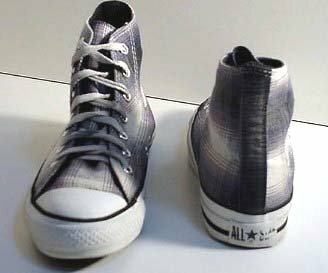 8 Plaid High Top and Low Cut Chucks Grey and white wool plaid high tops, inside patch and rear views. 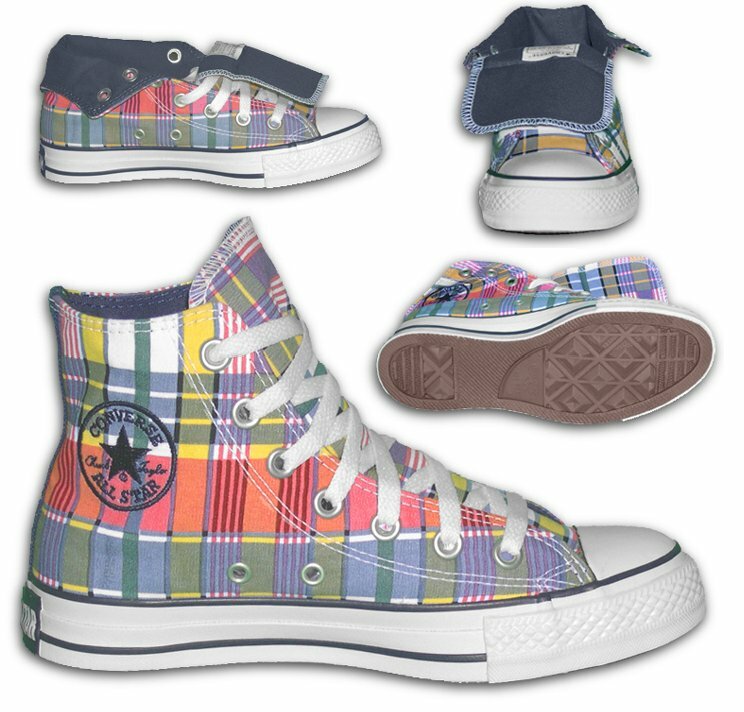 9 Plaid High Top and Low Cut Chucks Red, green, and gray woolen plaid high tops, side views. 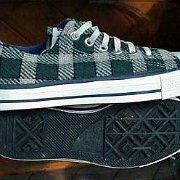 10 Plaid High Top and Low Cut Chucks Red, green, and grey woolen plaid high tops, front view. 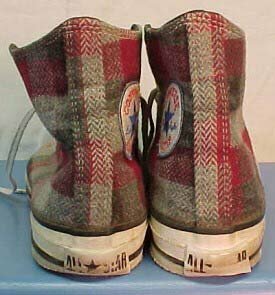 11 Plaid High Top and Low Cut Chucks Red, green, and grey woolen high tops, rear view. 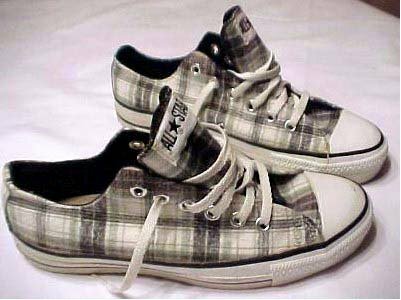 12 Plaid High Top and Low Cut Chucks Grey and white woolen plaid high tops, angled side views. 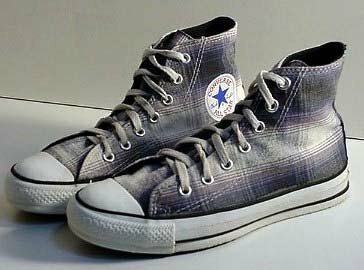 13 Plaid High Top and Low Cut Chucks Grey and white woolen plaid high tops, front and rear views. 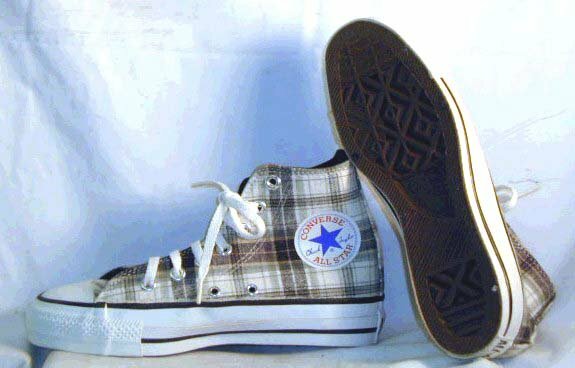 14 Plaid High Top and Low Cut Chucks Grey and white woolen plaid high tops, inside patch and sole views. 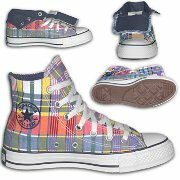 15 Plaid High Top and Low Cut Chucks Blue, yellow, and white wollen plaid high tops, side views. 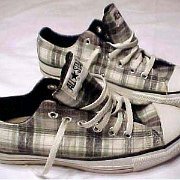 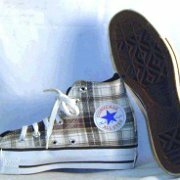 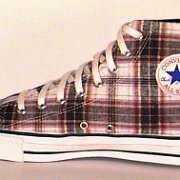 16 Plaid High Top and Low Cut Chucks Brown, grey, and white woolen plaid high tops, inside patch and sole views. 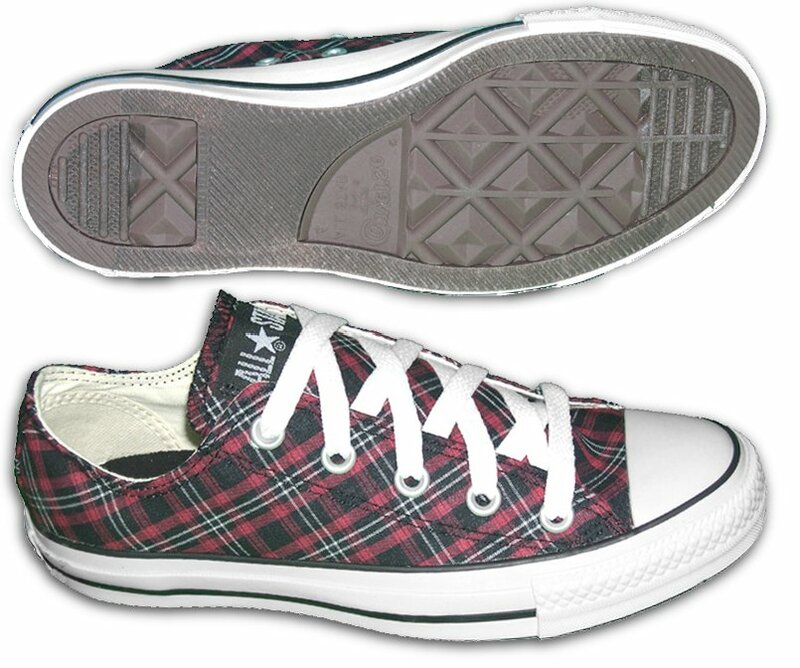 17 Plaid High Top and Low Cut Chucks Black, maroon, and white woolen plaid high tops, left inside patch view. 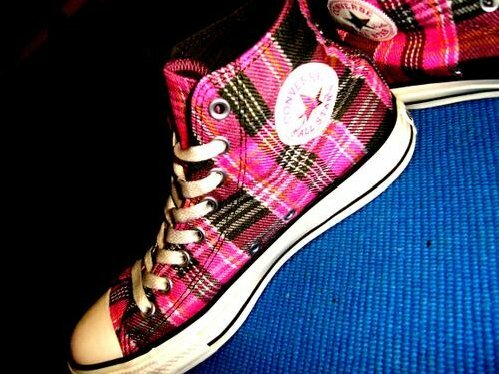 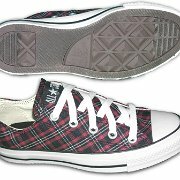 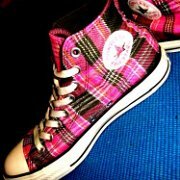 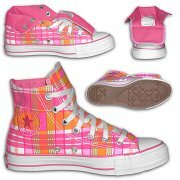 18 Plaid High Top and Low Cut Chucks Black, maroon, and white woolen plaid high tops, right inside patch view. 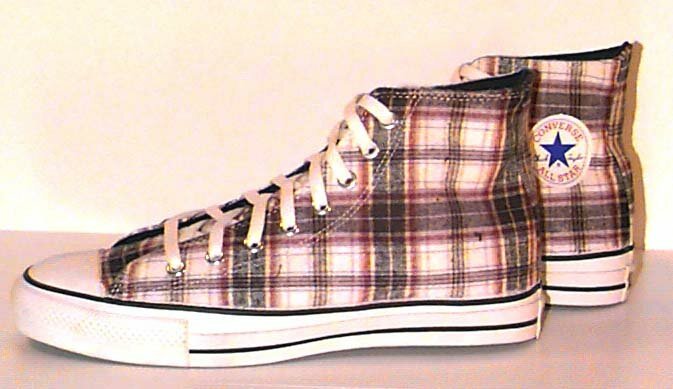 19 Plaid High Top and Low Cut Chucks Black, maroon, and white woolen plaid high tops, side views. 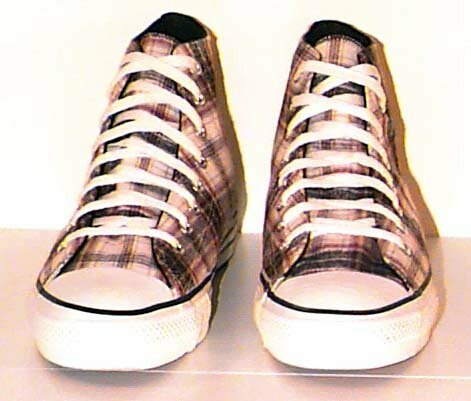 20 Plaid High Top and Low Cut Chucks Black, maroon, and white high tops, rear view. 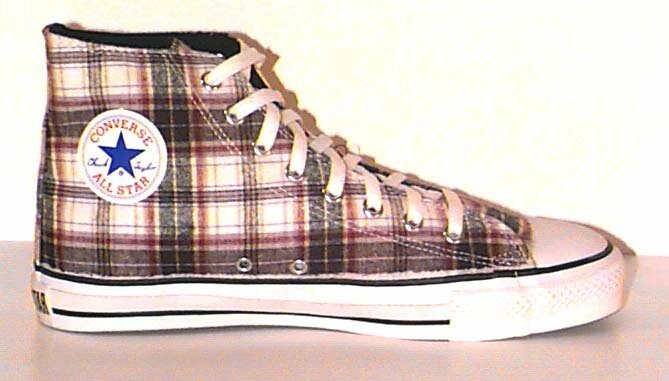 21 Plaid High Top and Low Cut Chucks Black, maroon, and white woolen plaid high tops, front view. 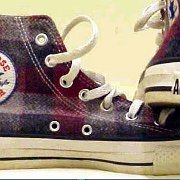 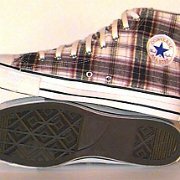 22 Plaid High Top and Low Cut Chucks Black, maroon, and white woolen plaid high tops, inside patch and sole views. 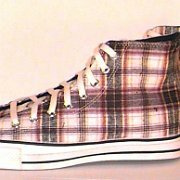 23 Plaid High Top and Low Cut Chucks Black, maroon, and white woolen plaid high tops, side view. 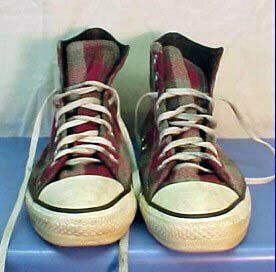 24 Plaid High Top and Low Cut Chucks Inside patch views of red and black palid high top chucks. 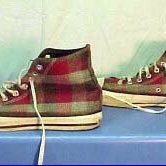 25 Plaid High Top and Low Cut Chucks Red and green woolen plaid high tops, top and angled side views. 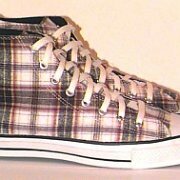 26 Plaid High Top and Low Cut Chucks Grey and yellow plaid low cuts, top and sole views. 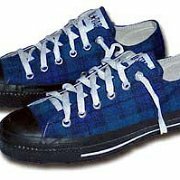 27 Plaid High Top and Low Cut Chucks Royal blue and black plaid low cuts, side view. 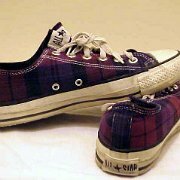 28 Plaid High Top and Low Cut Chucks Purple and red plaid low cuts, side and rear views. 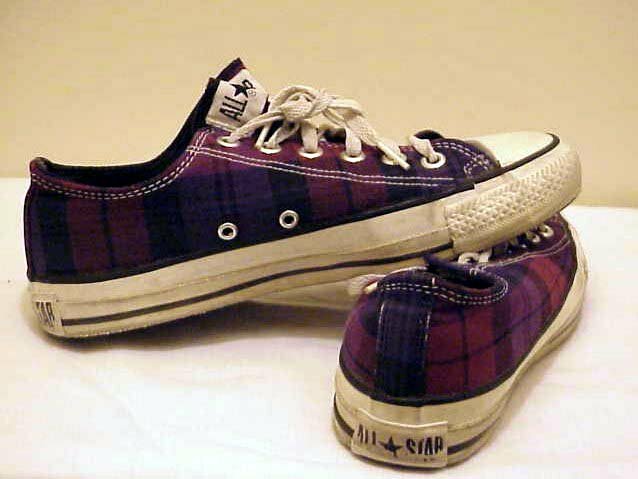 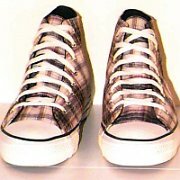 29 Plaid High Top and Low Cut Chucks Purple, maroon, and white low cuts, side and angled rear view. 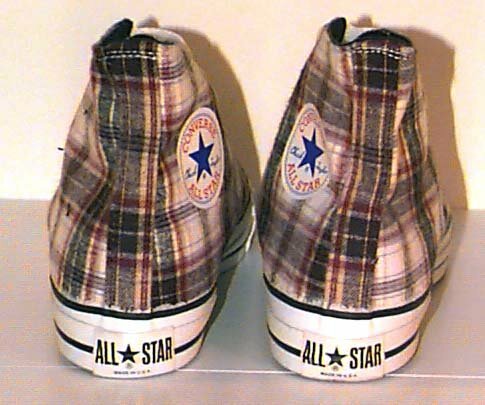 30 Plaid High Top and Low Cut Chucks Worn grey and red low cuts, angled side view. 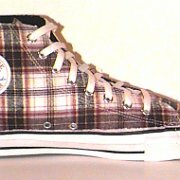 31 Plaid High Top and Low Cut Chucks Grey, maroon, and white low cuts, side views. 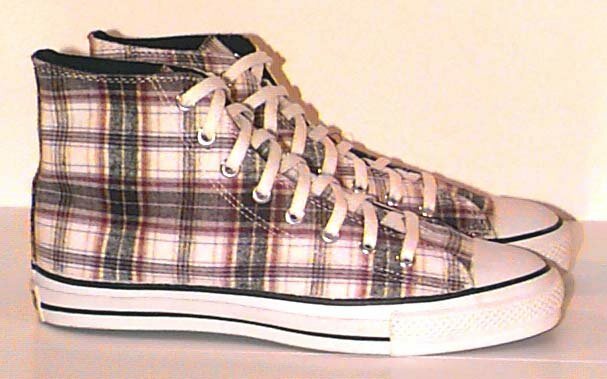 32 Plaid High Top and Low Cut Chucks Grey, maroon, and white low cuts, side and top views. 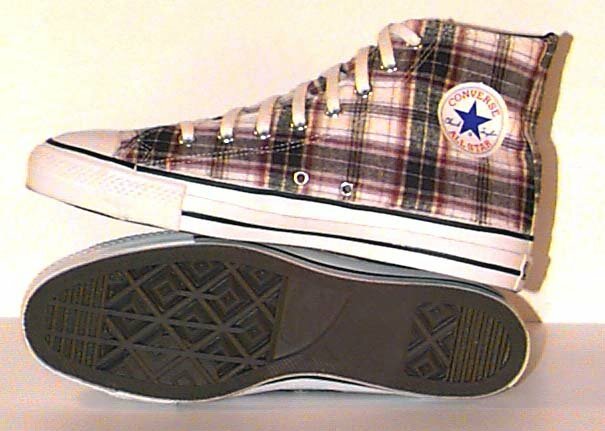 33 Plaid High Top and Low Cut Chucks Grey, maroon, and white low cut, rear view. 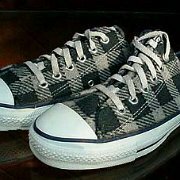 34 Plaid High Top and Low Cut Chucks Black and grey plaid low cuts, angled side view. 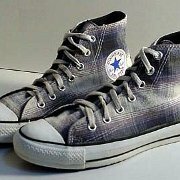 35 Plaid High Top and Low Cut Chucks Black and grey woolen plaid high tops, front and rear views. 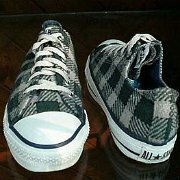 36 Plaid High Top and Low Cut Chucks Grey and black woolen plaid low cuts, outside and sole views. 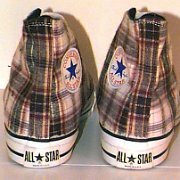 37 Plaid High Top and Low Cut Chucks Red, black, and grey low cuts, top and side views. 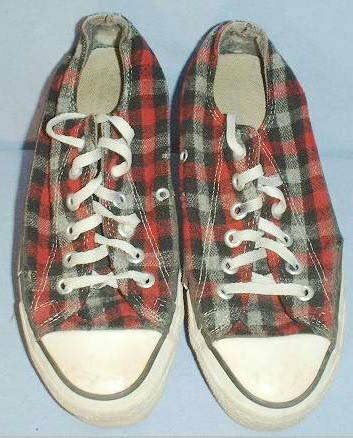 38 Plaid High Top and Low Cut Chucks Worn black, red, and grey low cuts, top view. 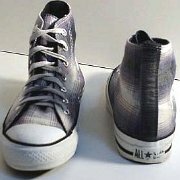 39 Plaid High Top and Low Cut Chucks Grey and white plaid woolen low cuts, side view. 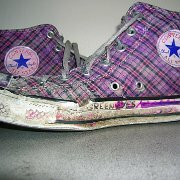 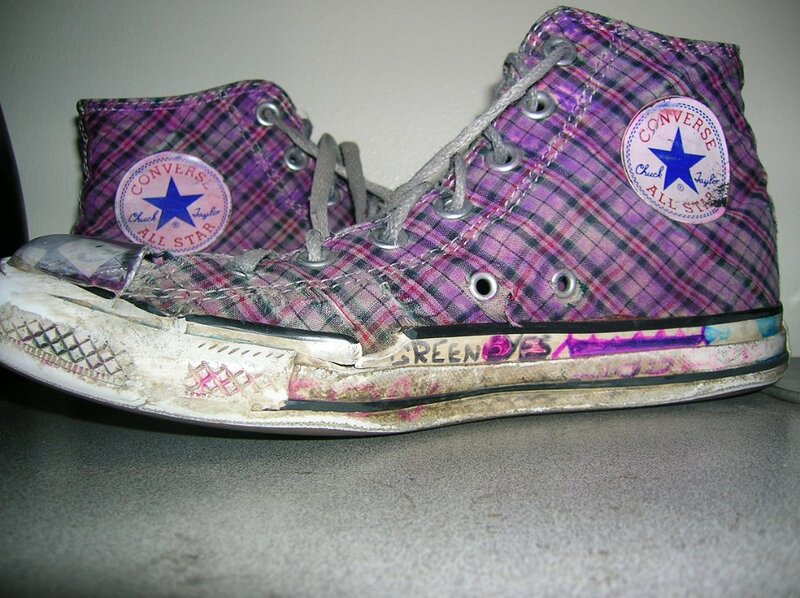 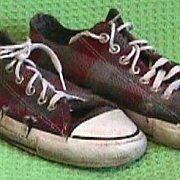 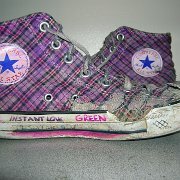 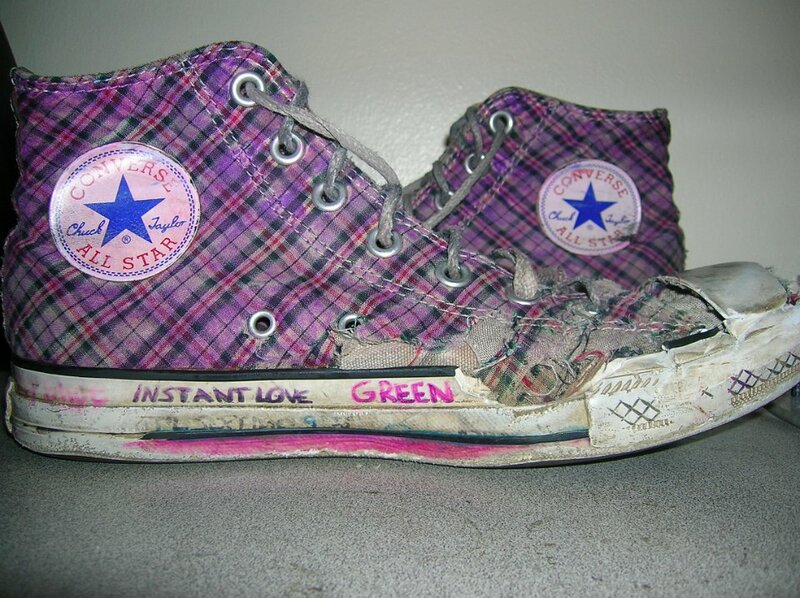 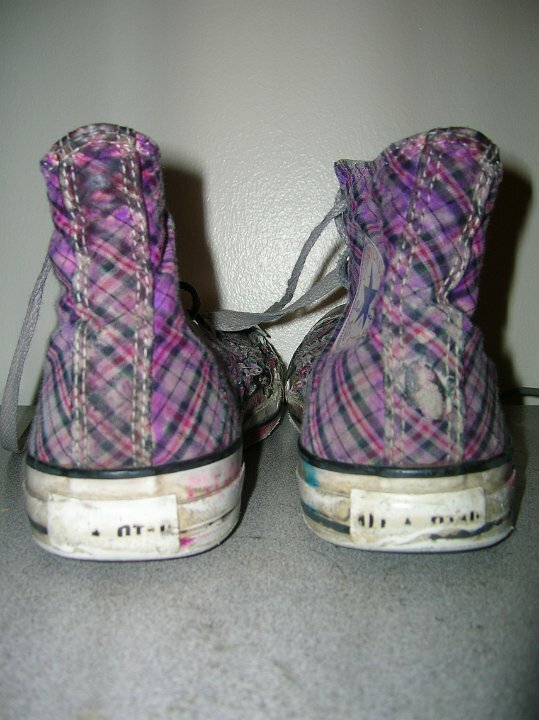 40 Plaid High Top and Low Cut Chucks Inside patch views of well worn purple plaid high top chucks. 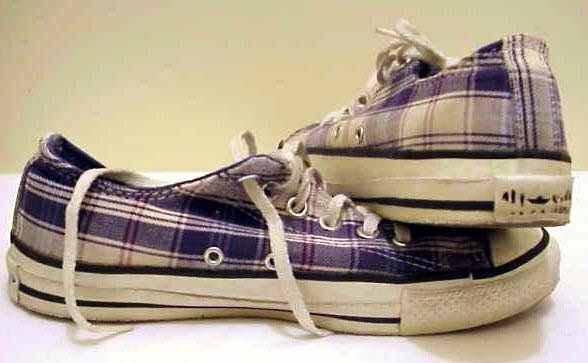 41 Plaid High Top and Low Cut Chucks Inside patch views of well worn purple plaid high top chucks. 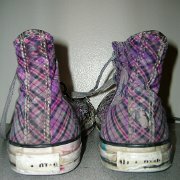 42 Plaid High Top and Low Cut Chucks Rear view of well worn purple plaid high top chucks. 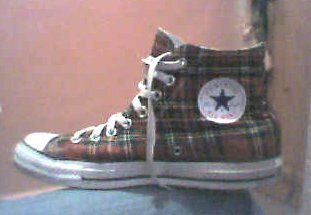 43 Plaid High Top and Low Cut Chucks Side and sole views red and green plaid low cut chucks. 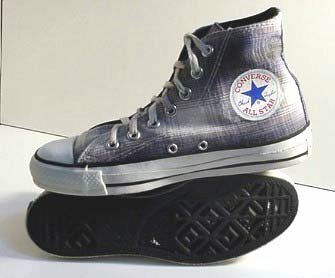 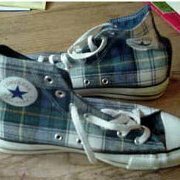 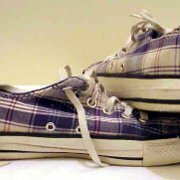 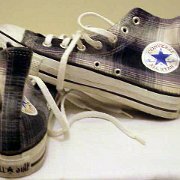 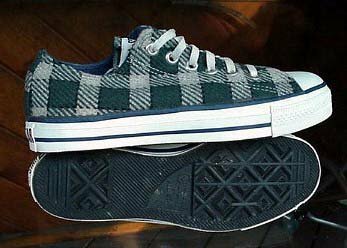 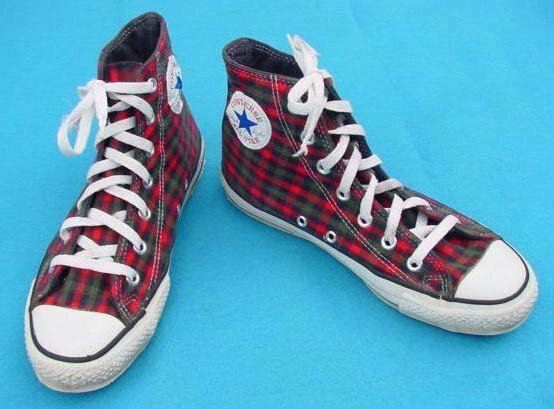 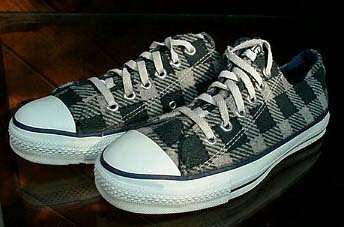 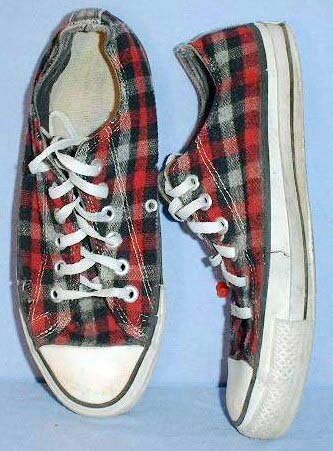 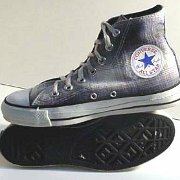 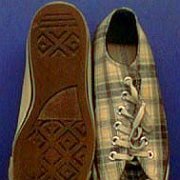 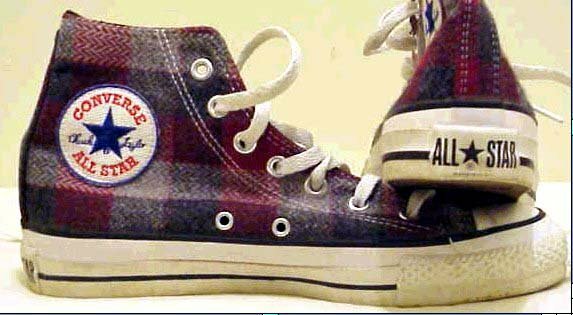 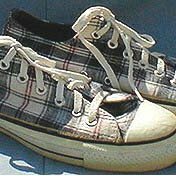 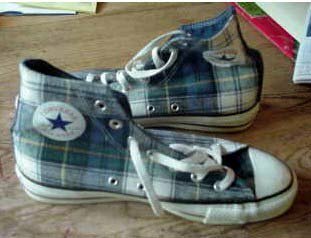 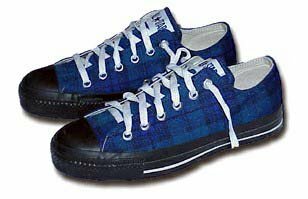 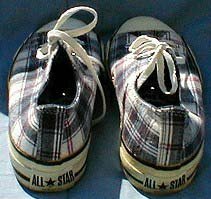 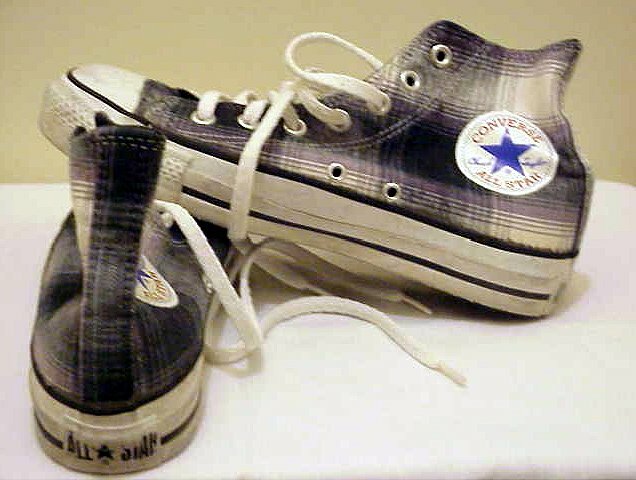 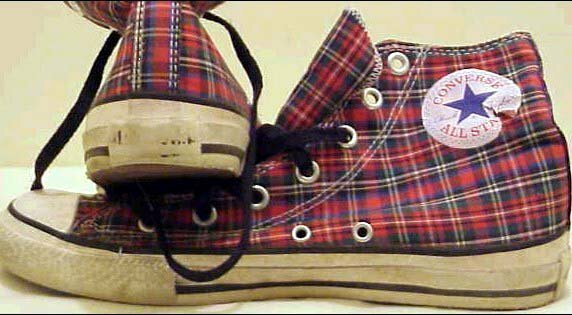 Since Converse started making Chuck Taylors in a variety of colors, various special fabric patterns, including herringbone woolen plaid fabric models have been produced from time to time. 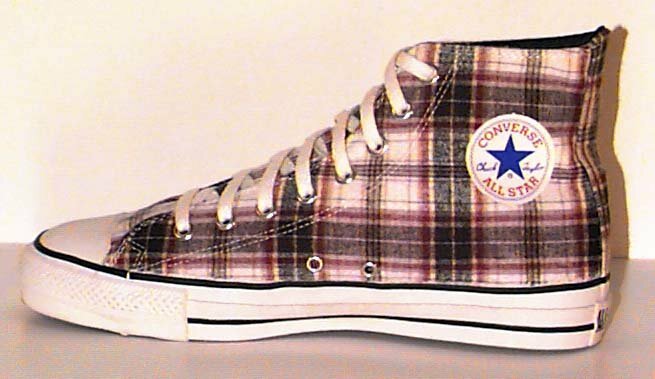 Other than leather Chucks, the plaid models are the only ones not made from canvas. 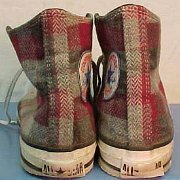 Another type of plaid, in red and green is used in the Christmas holiday pattern shown elsewhere.